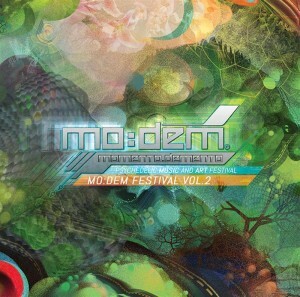 MoDem Festival Vol. 2, the second compilation from the creators of MO:DEM Festival, embodies the spirit of the event with an exceptional line-up of artists exploring the most twisted contours of the psytrance bass line. This is 100% psychedelic ear candy articulated with precision at 148 to 150 BPM. Mirroring the uniqueness of the MO:DEM sound, this next chapter takes no prisoners and transforms any space into a vortex for peak-level grooving. Play at your own risk! Mastered by EVP. MP3 Download | FLAC Download | WAV Download · Download count: 20,897.
delicious trips for the ones who know! YES!!!! Very good quality Psy!! Love it!! MoDem rocks!! Like the Momento Festival before it, this collection takes us on another twisted journey into the mind. Awesome album!! When i start unraring the .Wav files it stops to tell med there is an error. Tried to download it again and again and sometimes it crashes after unraring a couple of tracks. Is it broken or maybe something else? EVEN THOUGH HI-TECH IS MY THING!!!! Absolutely loving this album! Mo:Dem has such a stacked line-up and this show cases the talent nicely. Excellent album, it reminded me a reaally old PC Game: Another World, for some unknown reason. Awesome VA guys!! Of course, wherever i see Meerkut and Loose Connection tracks success is guaranteed!! Mo:Dem is simply the best !!! So glad I tried it. Haven’t heard anything above 146 bpm I’ve enjoyed but saw EVP on it so thought I’d give it the benefit of the doubt. SO glad I did! Mmmh! Think I might just put it on again! Adios Muchachos! total dancefloor killers, absolutely badass thanks!